WELCOME TO THE NEW ERA OF TRAVELING IN STYLE. A 113-cubic-inch V-twin powered neo-streamlined cruiser with locking sidebags, detachable windshield & passenger backrest, and chrome everything. Jewel-like fit and finish, and Star quality paint, chrome and attention to detail are evident all over the Stratoliner. New-design classic-clock style instrumentation complements Stratoliner’s neo-retro look and includes analog speedometer, tachometer and fuel gauge along with digital twin tripmeters, odometer and diagnostics. Bright multireflector headlight, LED taillight and amber turnsignals behind clear lenses give a custom look. A sliding cover over the main switch gives a clean look when the Stratoliner’s parked. Windshield and backrest lock into place for added security. Oxygen sensor and three-way catalyst reduce emissions and meet EPA 2006 requirements. Sidebags detach easily for cleaning. All-new aluminum frame is light, rigid, and requires few welds. A light, Controlled Fill swingarm casting complements the bike’s streamline style. With 49.6-percent of its weight carried on the front wheel, the Stratoliner has the weight distribution of a sportbike instead of the typical cruiser, and that means great handling. 46mm fork tubes wearing slant-cut chrome covers serve up an excellent ride and a sweet appearance. A thick, richly chromed handlebar in chrome clamps carries the Stratoliner’s switchgear wiring on the inside. All-new seamless, teardrop fuel tank carries a full 4.5 gallons of fuel. 12-spoke wheels evoke a thick spoke look, but carry modern tubeless radial tires; a 130/70-18 front and a fat 190/60-17 rear. New-design front brake master cylinder with integrated lever operates a pair of 298mm front discs squeezed by strong monoblock calipers for excellent power and feel. Strong and light belt final drive routes power smoothly and efficiently to the rear wheel. 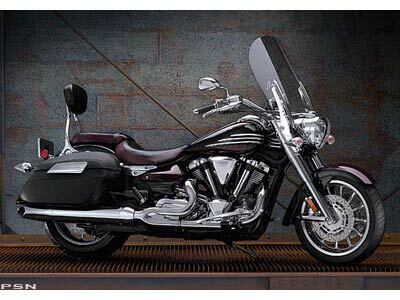 113-cubic-inch (1854cc) air-cooled pushrod 48-degree V-twin has the massive looks and performance to make the Stratoliner the king of the Star family. Plated cylinders forged pistons cooled by oil jets provide outstanding reliability and long life. Twin counterbalancers keep it smooth but rumbly. Computer-controlled Twin-bore fuel injection monitors multiple engine parameters to calculate perfect mixture under all conditions; a wide-angle 12-hole fuel injector provides excellent atomization. Exhaust Ultimate Power valve (EXUP) inside the two-into-one exhaust system boosts torque in the 2500-3000 RPM range. Special, NC processing of the cooling fins gives a jewel-like appearance to the engine as light hits it from different angles. 3300 RPM at 75 mph gives some idea of the Stratoliner’s power and cruisability. Maximum torque is occurs at only 2500 RPM. A pair of streamlined, leather-covered, locking, hard sidebags, a adjustable, quick detachable windshield, and a quick detachable passenger backrest make the Stratoliner excellent for long hauls and short trips. All-new 113-cubic-inch (1854cc) air-cooled pushrod V-twin produces great thrust at any speed. Neo-streamline design, including the first seamless fuel tank on a Star cruiser, gives the Stratoliner highly distinctive, custom looks. All-new long and low aluminum frame provides great looks and great handling, too, thanks to near 50/50 weight distribution on the front and rear wheels.